FOREX TRADING GUIDE: FIBONACCI FOREX TRADING: HOW TO APPLY THE FIBONACCI SERIES IN FOREX TRADING? FIBONACCI FOREX TRADING: HOW TO APPLY THE FIBONACCI SERIES IN FOREX TRADING? Leonardo Fibonacci, an Italian mathematician who first introduced the excellent Fibonacci series which is very widely applied in forex trading. Every forex traders should be introduced with the Fibonacci series and the Fibonacci ratios. The series is a very simple series of numbers. Even Leonardo Fibonacci might not know that one day his proposed series will be applied by millions of traders world wide. The Fibonacci series is 0, 1, 1, 2, 3, 5, 8, 13, 21, 34, 55, 89, 144…The series is started with 0 followed by 1, and third number is derived by adding 0 and 1, similarly the fourth number is derived by adding third and second number. This way the series is forwarded. 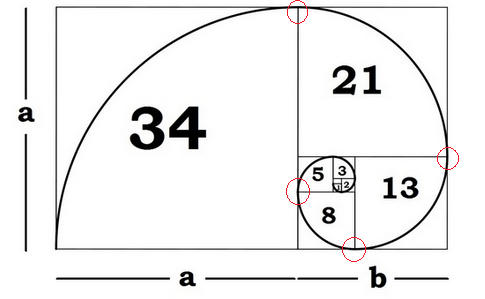 Fibonacci series are very closely related with the golden ratio hence the golden spiral. In forex trading, the Fibonacci series is not directly applied that much, but its ratios are applied at a huge rate. The Fibonacci ratios are calculated using the numbers in the Fibonacci series. The small phi (0.618), which is closely related with the golden ratio, is calculated with two consecutive numbers in the Fibonacci series. The most widely applied Fibonacci ratios are 1.00, 0.236, 0.382, 0.50, 0.618, 0.886, 1.13, 1.41, 1.618, 1.41, 2.618 and so on. In forex trading, harmonic chart patterns, that are drawn using the Fibonacci retracement tool, are very widely used to find the entry and exit signals. Most remarkable advantage of these harmonic chart patterns is that you can gain maximum profit with tight stop loss with these patterns. Fibonacci retracement tools are also used to find the potential support and resistance levels. Fibonacci extension tool is used to predict the trend. Fibonacci retracement tool can be used by both breakout traders and range traders. When a trend reaches to a Fibonacci ratio greater than 0.382, a correction is very expected in the trend.When a trend breaks a Fibonacci ratio greater than 0.382, a strong bullish or bearish trend is suggested. When a Fibonacci ratio is broken buy the trend, it becomes a resistance in case of bearish trend and a support in case of bullish trend. I found the Fibonacci tools as very effective technical analysis tools in my trading strategy. I even cannot think a single order or exiting an order with out the Fibonacci tools. Even Fibonacci ratios are also applied in pivot point analysis. If you are introduced with Fibonacci pivot points, you must know how the Fibonacci ratios are applied to calculate the pivot points. These are all about the basic of Fibonacci forex trading. In my next post, I will write about applying Fibonacci tools in forex trading. If you have any question, simply drop a comment below. You can enter you email in the subscription box to receive the updates.